Damien Oliver has ruled himself fit to ride over the weekend at The Valley and Flemington but his 2018 Melbourne Cup mount Red Verdon is in doubt for the famous two miler after suffering a hoof injury. Damien Oliver, above, is confident he will be fit to ride on the weekend. Photo by Ultimate Racing Photos. Oliver had to relinquish his ride on Lucky Fish in the last race at the Bendigo Cup meeting on Wednesday after his foot got jammed up against a gate on the way to the barriers, but subsequent x-rays have cleared the champion hoop of any serious injury. 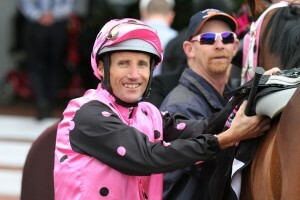 Oliver’s manager Mark Vantriet said that the three times Melbourne Cup winning jockey will be able to take his mounts at The Valley on Friday night as well as his mounts at Flemington on Derby Day on Saturday. “It bruised up pretty quickly and that concerned him,” Vantriet told racing.com. “It’s pretty tender and there’s still bruising, but he’s getting around fine. There’s no break. Oliver has been booked to ride Red Verdon in Tuesday’s Group 1 $7.3m Lexus Melbourne Cup (3200m) at Flemington but the Ed Dunlop trained English stayer will have to overcome a hoof injury before acceptance time on Saturday afternoon. Travelling foreman Robin Trevor-Jones said that the stable was confident that Red Verdon would respond to treatment quickly and will be inspected by Racing Victoria vets after a gallop on Saturday morning. Hong Kong’s premier jockey Zac Purton was aboard Red Verdon when he ran eleventh to Best Solution in the Group 1 $5m Stella Artois Caulfield Cup (2400m) at Caulfield on October 20. Red Verdon’s Melbourne Cup price at Ladbrokes.com.au has drifted out to $41 following the news of his injury while the Aidan O’Brien trained Yucatan sits at the top of the market order at $4.50. Early betting for the 2018 Melbourne Cup at Ladbrokes.com.au: $4.50 Yucatan, $9 Magic Circle, Cross Counter, $11 Avilius, $12 Muntahaa, $14 Best Solution, $16 The Cliffsofmoher, $17 Youngstar, Marmelo, Rostropovich, $21 Finche, $26 Ventura Storm, $34 Runaway, Sound Check, $41 Chestnut Coat, A Prince Of Arran, Red Verdon, $51 Jaameh, Thinkin’ Big, $61 Ace High, Who Shot Thebarman, $81 Brimham Rocks, Tosen Basil, Vengeur Masque, $101 or better the rest. Damien Oliver’s ride for the weekend. Race 1 – Taikun Warrior, Race 4 – Rex Bell, Race 6 – He Ekscels. Race 2 – El Dorado Dreaming, Race 5 – Thorondor, Race 6 – Bring Me Roses, Race 7 – Grinzinger Star, Race 9 – Booker.